TMJ is simply an abbreviation for the Temporomandibular Joint. When people are referred to as having “TMJ” it refers to a vague diagnosis of jaw related pain. 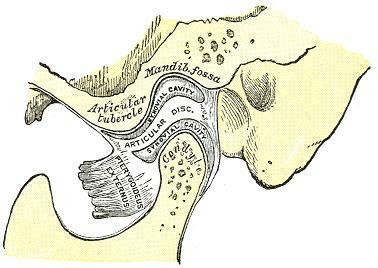 The TMJ is the jaw joint or moving part of the jaw and is situated immediately in front of the ear. The lower jaw is unique in having two joints to control its one movement. The movement of the joint itself is somewhat unique as in order to open fully two different types of movement in the joint take place. The joint is a ball and socket type joint, with the ball or condyle moving within the socket. The action of chewing essentially only involves a rotation type movement as in other joints in the body. Full opening involves initial rotation followed by forward or translation movement of the condyle. In order for the two different types of movement (rotation and translation) to take place the joint has a disc between the condyle and the socket. This disc commonly moves out of position (displaces), in most cases without any serious consequences although in extreme cases an opening restriction may occur. This is often referred to as jaw locking. Jaw locking means that the jaw will usually only manage to complete its initial rotation movement only and the translation that is needed for full opening is not possible. The net result of this is that with jaw locking the jaw will open about 30 millimetres only. Normal full jaw opening is 40-50 millimetres as measured from edge of lower front teeth to edge of upper front teeth. It is important to realise that jaw locking where it occurs does not mean that the jaw will not open at all and that generally the degree of opening in locking is a little more than half the normal. More pronounced restriction in jaw opening is usually caused by muscular restriction.